Sometimes I find the best thing about taking a vacation is that you CAN party during the day. There’s no boss saying you can’t have that margarita. In Cabo, you can stretch out in the sun and enjoy your vacation all day long; whether that means getting on stage for a booty dancing contest or simply enjoying that cocktail while your friends put on their snorkeling masks. But the worst thing about wanting to celebrate during the day is when you show up to a place and there’s no one else having a good time. Medano Beach is queen of the day time partying. Walk along this popular stretch of sand and you will find many people having a good time. This party spot on Medano Beach offers everything from booty dancing to congo lines. Expect balloon hats, tequila shots and good time. They serve breakfast, lunch and dinner. The Office is a Cabo landmark; Sure you might not be working, but you can still call everyone and tell them you are “at the Office.” This is a great place to grab a table on the beach, enjoy your margaritas and watch the Medano Beach environment. Nikki Beach is popular for its Bali Beds and DJs spinning during day. They have a swim up bar and restaurant as well. Check out their calendar for when they have their famous pool parties – you won’t want to miss them! Many bars and restaurants are along the Marina; there’s even a shopping mall. Walk around and you’ll find plenty of 2×1 deals and happy hours. Baja Cantina Marina (they have a sister restaurant on the beach) is home to the Bisbee Headquarters during the famous Bisbee’s Black and Blue Marlin Tournament. They have happy hour all day and tons of big screen TVs for those sports games. They have great drinks and you can watch the fishing boats come in. Catch a fish while fishing? Baja Cantina will cook it for you. And of course if you are staying at large resort or hotel, the swim up bar is ALWAYS a good place to meet other people looking to have a good time! 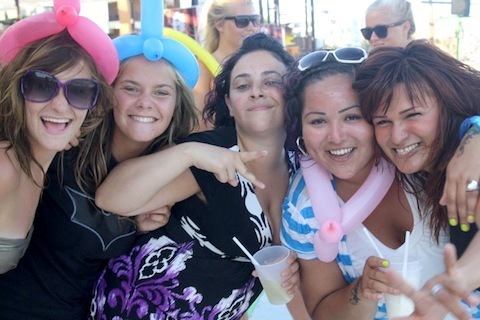 Where did you party during the day in Cabo?